The Episode starts with Jai replying to Karan that he would have killed the man if he comes to know that he is responsible for Vihaan’s condition. The boys and the girls have a talk. Diya asks Aadhya to handle Jai else PK will also get spoiled. Aadhya says we will go as they are drinking wine. Karan says I don’t drink, but is here. He says lets play a game. PK says lets play dumb charades. Aadhya says Antakshiri. Jai says truth and dare. Karan says it is good and eyes Vihaan. Vihaan gets tensed. The bottle stops at Vihaan. Karan says he will take truth.Vihaan is scared and drinks wine. He asks them to play and leave. Next Jai turns comes. PK says he will take 100 percent dare. Ragini asks him to show one Live example of his love. Jai holds Aadhya’s hand and looks at her. He imagines dancing with her, their marriage and wedding night. Ragini says we asked you to give a small example, but you made a love story. Diya looks at PK. A fb is shown, Diya sits on him while he exercises. He falls. They laugh. All of them start playing the game. Diya says it shall come on you, as I wanted to know how much you love me. Aadhya sees Jai taking selfies with Ragini and she holding his hand. Aadhya gets jealous. Jai and Ragini turn towards each other. Karan turns come. Ragini says he will take dare. Aadhya asks Ragini to go to side and sits between them. Jai takes Aadhya with him to get some snacks. They go to kitchen. He asks why she is angry. Aadhya says I am angry. She says Ragini is good, but why she is close to you. he says she was about to kiss you. Jai asks what are you saying? Aadhya asks if someone touches me. jai says I will take his life. Ragini comes and interrupts their conversation. She asks them to bring snacks. Everyone was watching news about business man’s daughter eloping from her marriage. Jai says whatever girl did was right, as marriage is not a business deal. He posts a comment. Aadhya says how can you comment without testing the facts. Jai says I had a thought so I posted. He says Jai Mittal commented after a lot of time. Aadhya says people follow you so you shall be careful. Ragini interferes and says it is his personal opinion. PK asks them not to argue. Aadhya tells that they are getting late and will go home. Jai tries to stop them. They leave. Vihaan thinks to tell truth to Jai and thinks he can’t stay quiet for long. Jai waits for Aadhya in the office and thinks to go LIVE. He starts the programme. Aadhya is still at home. Ragini comes there surprising Jai. Ragini starts the programme. Aadhya is upset. A caller calls and says he is jealous to see him with someone else. Jai gives him suggestion. Next call comes. Aadhya gets upset. Ragini says people loves you so much. Jai says I used to comment on everything before, but since Aadhya is in my life, I am not commenting much. Again a call comes, a man asks if he will comment if there is a news on his family. Jai says yes. He thinks Aadhya didn’t come today. The man in black hood posts Jai and Ragini’s pic on social media. Ragini goes to the washroom. Jai thinks if Ragini fainted inside. He goes to the girl’s washroom and takes her outside, lifting her. Media comes there and clicks their pics. Jai thinks what to do. Karan and Aadhya watch the video. Karan asks Aadhya who is this girl with Jai. Jai thinks why she is not gaining consciousness. They see Ragini’s face. Reporter asks Jai if they are having an affair and asks him to say about Ragini. Aadhya asks Jai about the incident. Jai gets upset as Aadhya asks for clarification. 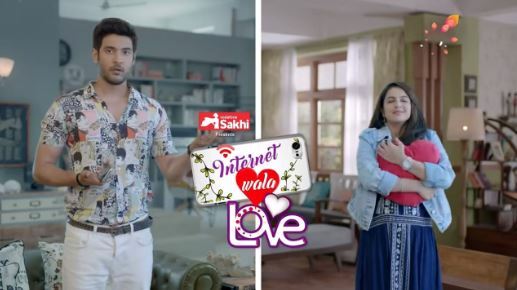 The post Internet Wala Love 22nd February 2019 Written Episode Update: Jai gets stricken by the series of conspiracies appeared first on Telly Updates.